1. Sang world premier as the Composer in Ariadne auf Naxos by Strauss (1916). 2. Sang world premier as the Dyer’s Wife in Die Frau ohne Schatten by Strauss (1919). 3. Sang Vienna premier, as Silla, in Pfitzner’s Palestrina (1919). 4. Sang the Vienna premier of Suor Angelica by Puccini (1920). 5. Sang the world premier as Helene in Die Kohlhaymerin by Bittner (1921). 6. Sang the Vienna premier as Blanchefleur in Der Kuhreigen by Kienzl (1921). 7. Sang the Vienna premier of Puccini’s Manon Lescaut (1923). 8. Sang world premier as Christine in Intermezzo by Strauss (1924). 9. 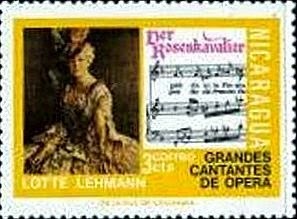 First woman to sing Sophie, Octavian and the Marschallin in Der Rosenkavalier (by 1924). 10. 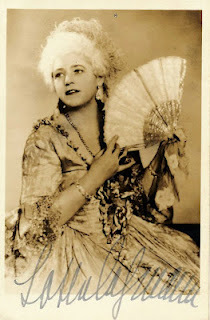 Sang the Vienna premier as Juana in Don Gil by Branfels (1925). 11. Sang the Vienna premier of Turandot by Puccini (1926). 12. First singer to receive the rank of Kammersängerin since the collapse of the monarchy (Vienna 1926). 13. 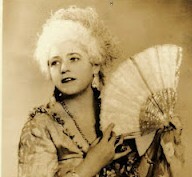 Sang the Vienna premier as Madeleine in Giordano’s André Chénier (1926). 14. Sang the Vienna premier as Heliane in Korngold’s Das Wunder der Heliane (1927). 15. First German to sing in Belgium after World War I (1929). 16. First German to receive the French Légion d’honneur after World War I (1931). 17. Sang Vienna premier of Arabella by Strauss (1933). 18. Sang the Vienna premier as Tatiana in Tchaikovsky’s Eugene Onegin (1934). 19. The vocal soloist chosen by Toscanini in his first US radio broadcast (1934). 20. First woman to record Schubert’s “Winterreise” and “Die schöne Müllerin” (1941). 21. First woman to record Schumann’s “Dichterliebe” (1941). 22. First woman to sing Beethoven’s “An die ferne Geliebte” song cycle (1948). 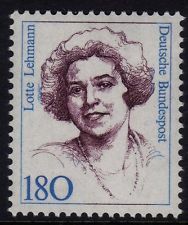 Undated honors include the building named the Lotte Lehmann Akademie in her birthplace (Perleberg); a street named for her in Vienna; a hall in her name at the Music Academy of the West (Santa Barbara, California); a regularly-scheduled week-long vocal institute in Perleberg, Germany called “Die Lotte-Lehmann-Woche”; a newsletter that ran for years; a foundation that lasted around 10 years; master-classes named for her at various summer festivals; and the regular flow of biographies, re-releases of her recordings and the appearances of her former students, now often in mentoring roles, but always with the mention of Lehmann. Marilyn Horne sang a series of recitals in the 1990’s called “Songs Lehmann Taught Me.” From the University of California, Santa Barbara; Northwestern University; the University of Oregon, Portland; and Mills College, Oakland, Lehmann recieived Honorary Doctorates. Lehmann received the title of Kammersängerin (the first singer to receive that designation since the collapse of the monarchy), 1926. Lehmann was made Ehrenmitglied der Wiener Staatsoper [Honorary Member of the Vienna State Opera], 1928. The King of Sweden conferred upon her the golden medal Literis et Artibus after a performance of Fidelio in February 1929. France promoted her from the Golden Palm to Officer of the Légion d’honneur (“Offizier der Ehrenlegion”) 1931. 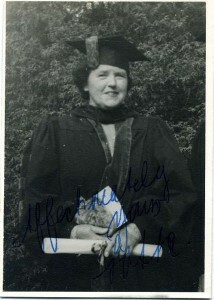 When Lehmann took out her first citizenship papers in the United States, her recordings were banned in Austria in October 1938. Lehmann’s first book, her 1937 autobiography “Anfang und Aufstieg,” was banned by the Nazis on their list of harmful and undesirable writings (“schädlichen und unerwünschten”) on December 31, 1938. 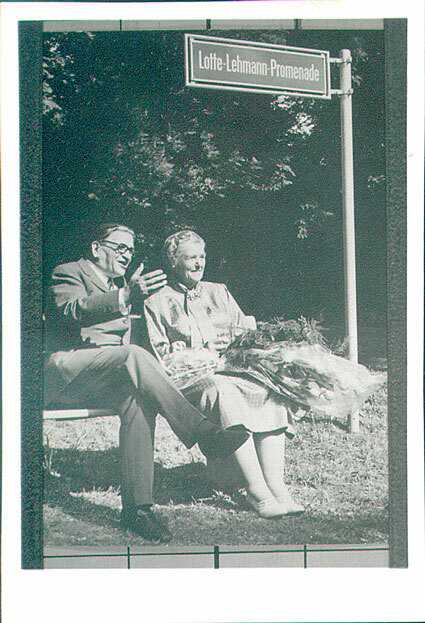 Lehmann receives the Lotte Lehmann Ring from the Vienna State Opera, 1955. Lehmann earned the Ehrenring der Stadt Wien [the Honor or Dedication Ring of the City of Vienna], 1962. 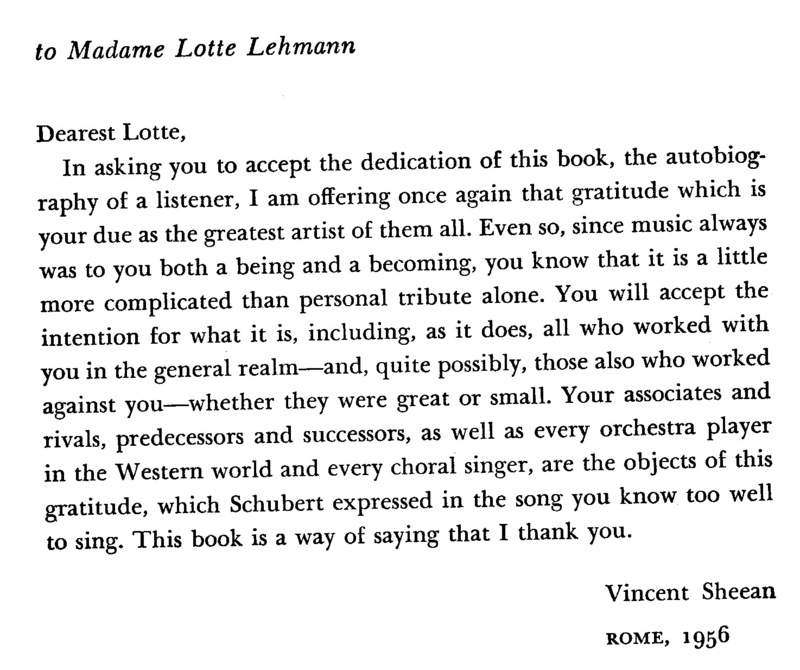 Lehmann was registered in the Goldene Buch der Philharmoniker [the Golden Book of the Vienna Philharmonic], 1962. From Germany, Lehmann received the “Großes Deutsches Verdienstkreuz” [the Great German Service Cross], 8 February 1964. The City of Santa Barbara proclaimed “Lotte Lehmann Day” 27 February 1968. 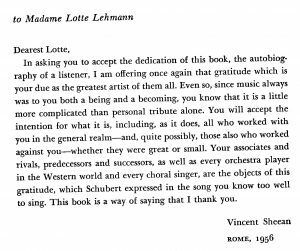 The Los Angeles Philharmonic, conducted by Zubin Mehta, celebrated Lehmann’s 80th birthday with a concert “dedicated to Lotte Lehmann in recognition of her invaluable contribution to the world of music as both performer and teacher” February 1968. The San Francisco Opera performed Die Walküre honoring Lehmann (who was there for both the performance and reception) 30 September 1968. University of California, Santa Barbara (UCSB) named and dedicated its concert hall for Lehmann, February 1969. Salzburg gave Lehmann the Große Silbermedaille der Stadt Salzburg, [the Great Silver Medal of the City of Salzburg], 1969. Perhaps at the same time (see above) Salzburg named a street after Lehmann. The photo is dated 1970. Nicaragua issued a Lehmann stamp in 1976. 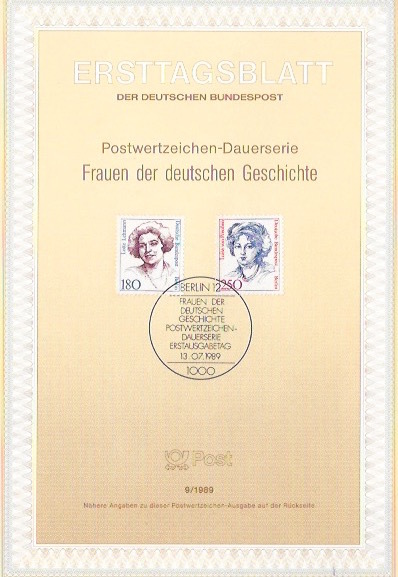 Germany honored Lehmann in 1989 with a stamp. 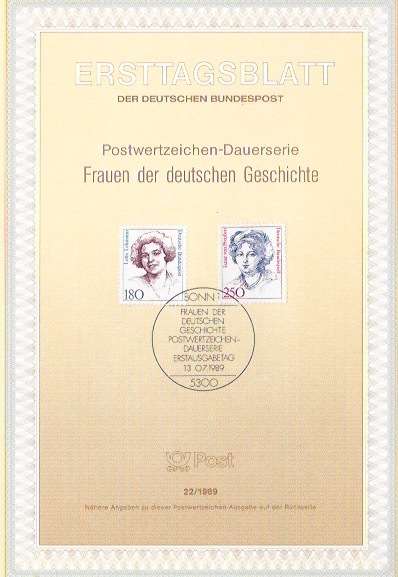 The first day covers (issued at that time from both Berlin and Bonn) can be seen below. In 1996 Vienna Donaustadt (22. Bezirk) named a street Lotte-Lehmann-Weg. 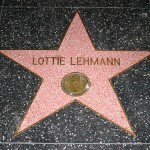 Perhaps a dubious honor, but Lehmann has a star in the Hollywood walk of fame. Her name is misspelled as Lottie. Grace Bumbry sings a series of recitals (2001-2002) in honor of Lehmann.